Prestige? Definitely. If anyone in the nation didn’t already think of North Carolina as “that state where they check your birth certificate before letting you pee,” they sure will now. Economy? Meh. 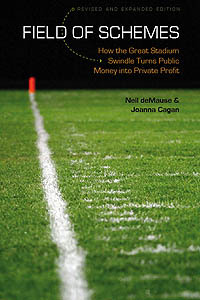 I’ve covered the myth that big sports events create a massive benefit for local economies at length both here and elsewhere — short version is, yes, having lots of people come to town for a few days generates some more economic activity, but not that much, since 1) a lot of the money goes straight to league pockets without landing in the local economy (leakage) and 2) everyone else steers clear of town those days who would otherwise be there, which cancels out the new visitors (substitution). How much is an All-Star Game actually worth? For the 2014 All-Star Game in Minneapolis, the estimate of new economic activity in the state was $21 million to $55 million; for the 2010 All-Star Game in Dallas, the estimate is zero. (And note that this is total economic activity; for actual tax revenue received, move the decimal point over at least one place.) The numbers might be a bit higher if you just looked at city economic activity rather than state, but “Now that Charlotte won’t have the NBA All-Star Game it won’t be able to cannibalize spending from Raleigh!” isn’t exactly the best rallying cry. But that’s actually fine — the point of maneuvers like this is less to hit local politicians in the pocketbook than to not allow them to play in any reindeer games. I used to know a lot of people in the international anti-apartheid movement, and they always said that one often overlooked piece of the decades-long struggle to force South Africa to allow blacks basic human rights was the international sports boycott: White South Africans, it turned out, could put up with constant protests and world economic sanctions and even guerrilla attacks better than they could with having their soccer and rugby and cricket teams locked out of those sports’ World Cups. It wasn’t the only factor by a long shot, but it did play a key role in getting F.W. de Klerk and his generation to the negotiating table. North Carolina isn’t being shut out of competing nationally, of course, it’s just losing an All-Star Game that, frankly, nobody really cares about. It’s still shame, though, and makes me wonder what would happen if, say, the NBA refused to let any of its teams play regular-season games in Charlotte on the same moral grounds. That would be fascinating to see, and while I don’t really believe it’s going to happen, it would certainly be putting the league’s money where its mouth is.